This selenite large tower lamp includes light kit. 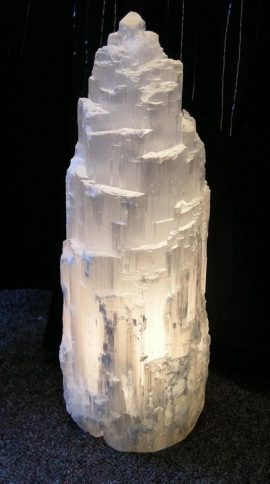 Can you imagine this selenite tower lamp in your meditation or healing space? Selenite will cleanse and purify your space. One of our favorite spiritual stones, Selenite is good for higher chakra work, communication with spirit guides and angels, and to stimulate physical healing. How can this crystal help you in your life? See the description below for a list of the physical, emotional, and spiritual properties of selenite. Magic Happens with Reiki Charged Herbal Pillar Candles. Each of our Herbal Magic Pillars have been designed with a specific intention using a unique blend of essential oils. 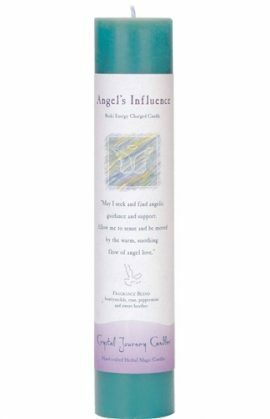 Use Angel’s Influence Pillar Candle to honor and call upon our Angels. Use in combination with Ascended Master and Guides to know you’re supported and loved. Use to honor and call upon our Angels. At Crystal Journey Candles, each of our candles are hand poured using the finest wax and an exotic blend of essential oils. The strong scent and colorful appearance of our candles are entrancing and delightful . We believe all of these factors create a better candle with an unique character. 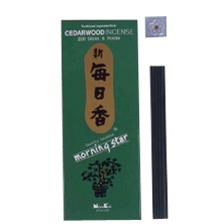 Use to assist in the voyage to deeper understanding in the meaning of life. Make a vibrant color addition to your gemstone collection with this Gaia Stone (also known as Helenite) Pendant. The rare checkerboard trillion cut of this gemstone adds a multidimensional brilliance. Let the energy of the Goddess empower and enlighten you on your life path with this eye-catching pendant! This stunning gem is 4-prong set in sterling silver with a movable bail. How can this crystal help you in your life? See the description below for a list of the physical, emotional, and spiritual properties of gaia stone. The crystal shown has been sold. However, we do have other similar and just as beautiful ones at our store in Harrisburg. This si opal aura quartz cluster radiates the energy of the angelic realm. 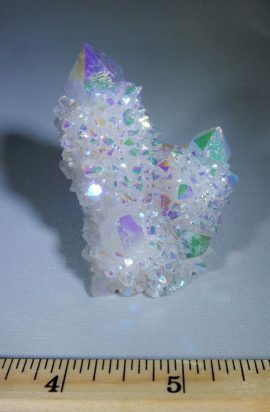 The true joy and excitement of the pure angelic energy that is harnessed in this power packed cluster is awaiting to adorn a meditation, prayer area, or any space that needs some angelic guidance and blessings. Si Opal Aura Quartz is a real crystal quartz treated with silicone. This moonstone ring with branch-like setting in sterling silver is sure to grow on you. 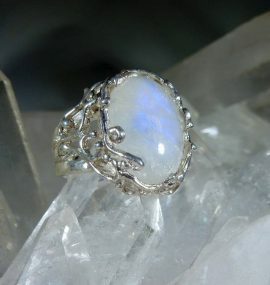 You can see the powerful rainbow flashes in the large moonstone cabochon organically nestled into a tree branch design. How can this crystal help you in your life? See the description below for a list of the physical, emotional, and spiritual properties of moonstone. 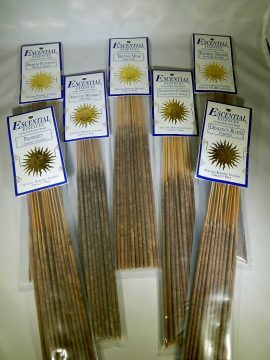 These Escential Essences Incense Sticks – Prosperity are feature a Cinnabar Cinnamon scent. 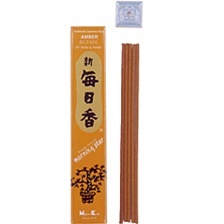 Burn prosperity escential essences incense sticks to help flourishing, successful, affluence, and well-being. Make a vibrant color addition to your gemstone collection with this Gaia Stone (also known as Helenite) Pendant. The rare checkerboard trillion cut of this gemstone adds a multidimensional brilliance. Let the energy of the Goddess empower and enlighten you on your life path with this eye-catching pendant! This stunning gem is 3-prong set in sterling silver with a movable bail. This peridot price is for one crystal. Photo shows some of the variations in size, color and quality that are possible. Each crystal is unique. No two are exactly the same or exactly as the ones pictured. We will do our best to select a special one just for you. How can this crystal help you in your life? 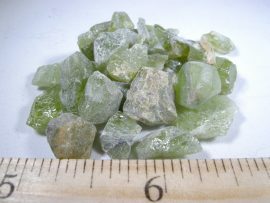 See the description below for a list of the physical, emotional, and spiritual properties of peridot. 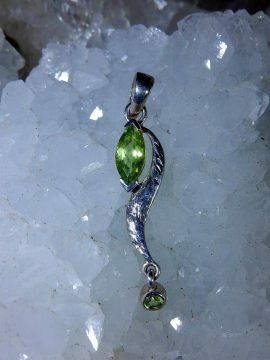 This peridot drop pendant in sterling silver with faceted marquise and round gems is set in a whimsical design. You will enjoy the unique movement in this piece. 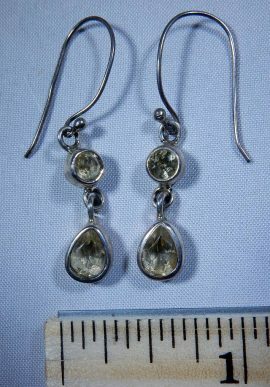 These citrine faceted earrings in sterling silver are great little sparklers for any event. Let these bring abundance into your life. 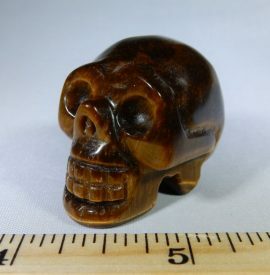 This natural skull, tiger eye, small is great for summoning the courage to achieve your goals. Get motivated by this power packed skull! How can this crystal help you in your life? See the description below for a list of the physical, emotional, and spiritual properties of tiger eye. These amber earrings, honey, golden, and green in sterling silver are vibrant and eye catching. 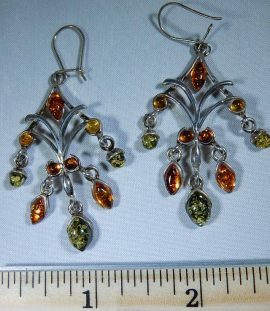 The elegant shape of these sterling silver earrings is matched in beauty by the colors found in the amber. 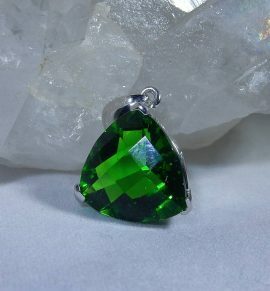 How can this gemstone help you in your life? See the description below for a list of the physical, emotional, and spiritual properties of amber. 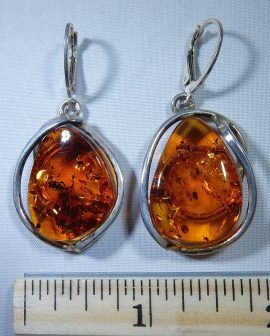 These amber oval earrings in sterling silver are lightweight for the size and a great honey color. These are warm and vibrant gems for promoting balance and harmony. Burn Time	Approx. 25 min. 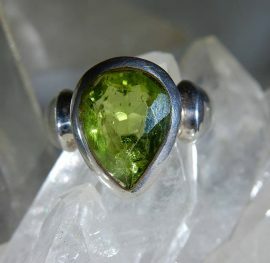 This peridot ring, faceted, pear shaped, bezel set, Sterling Silver is a solid piece. Wear this beautiful peridot ring and feel the abundance begin to flow into your life. This dazzling ring features a bezel set, faceted, pear-shape peridot set it sterling silver. It is comfortable and low profile even though the peridot is so big. 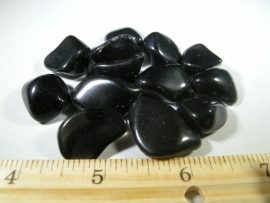 Great for attracting prosperity and money into your life and for keeping the heart open. 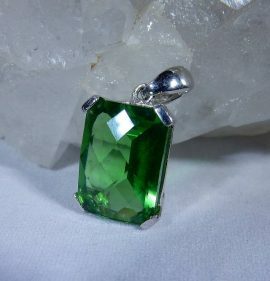 This vibrant green gem is one of the traditional birthstones for those born in August. 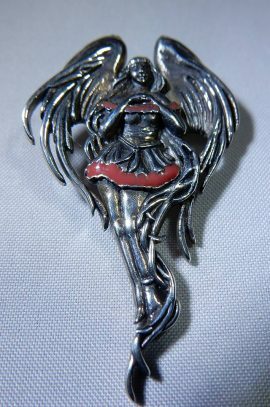 Angel (Pewter) Pendant is very detailed and enameled. You can have the loving, protective energy of the angels watch over you. This apache tear, smooth price is for one crystal. Photo shows some of the variations in size, color and quality that are possible. Each crystal is unique. No two are exactly the same or exactly as the ones pictured. We will do our best to select a special one just for you. How can this crystal help you in your life? See the description below for a list of the physical, emotional, and spiritual properties of apache tear. 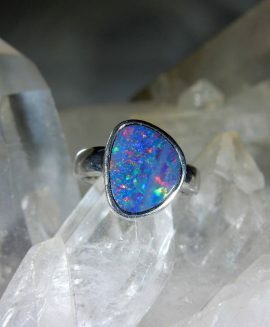 This Australian Opal Ring (Doublet) in Sterling Silver has a beautiful natural fire to it that glistens on your finger. Let the magic of opal flame heal and protect you. 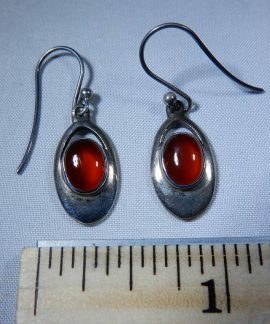 These carnelian cabochon oval earrings in sterling silver have a intense glow – a fire inside – with a warm ember energy of the flame. You will love to create and will be inspired by the flames of creativity with these earrings. 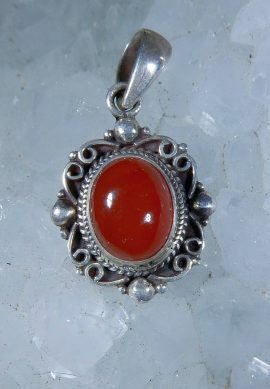 This Carnelian Oval Pendant is a great size for combining with other charms. You will also love the detailed filigree work that surrounds the oval cabochon gemstone. Burn Time Approx. 25 min. 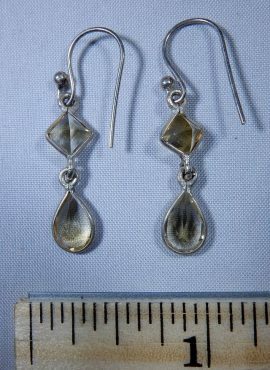 These citrine faceted earrings in sterling silver beautiful pear and round shapes. These dainty earring will give you the right amount of sparkle you need. 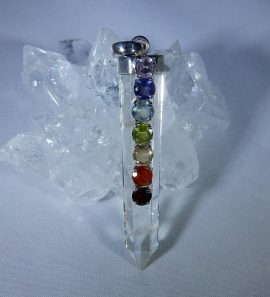 Chakra crystal point in sterling silver is a great combination of the clear white light of the quartz point and the energy of the all the chakra color rays in one pendant. You are sure to enjoy this balancing and healing treasure. 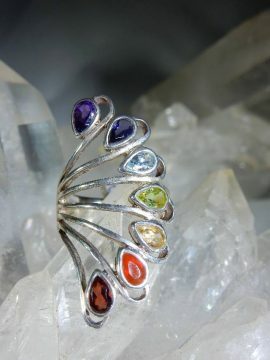 This chakra gemstone ring in sterling silver features faceted garnet, carnelian, citrine, peridot, blue topaz, iolite and amethyst. How can these gemstones help you in your life? See the description below for a list of the physical, emotional, and spiritual properties of these gemstones.